Collection Items: Armor Sets (Dungeon, Tier and Crafted), Mounts, Companians, Tabards, Legendary items and more. Season and World Events: Skettis, Abyssal Council, Ethereum Prison, Feast of Winter Veil, Hallow’s End, Brewfest, etc. Wishlist (NYI): Alt-click on any item to add it to the wishlist, alt-clicking on an item in the wishlist deletes it. There are buttons added to the Atlas panel and the loot browser to open the wishlist. Partial Searching (NYI): Allows searching the whole AtlasLoot database for an item where you only know part of the name. 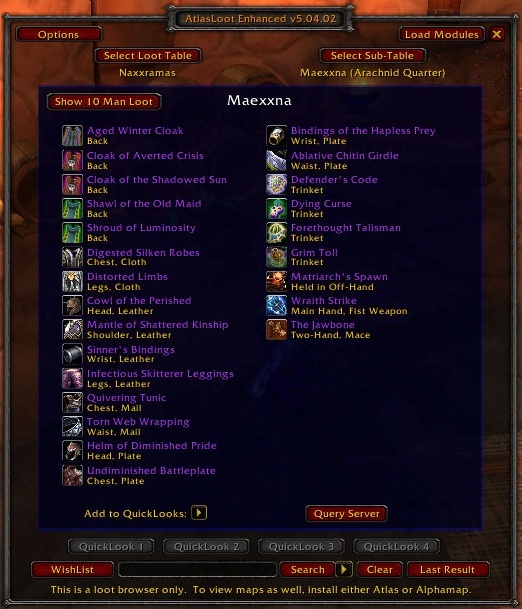 Quicklooks (NYI): Bind up to ten loot tables to ‘Quicklook’ buttons, allowing you to jump to them with only one click. ‘/al’ or ‘/atlasloot’ by itself brings up the loot browser. ‘/atlasloot options’ brings up the options menu. ‘/atlasloot reset’ resets the last viewed loot table (fixes disconnects when opening AtlasLoot) and moves all draggable frames back to the middle of the screen. ‘/atlasloot mmb’ toggles the minimap button on / off. ‘/atlasloot togglebg’ toggles background pictures on / off.